Alpine has a significant number of mule deer living within its boundaries. Residents don't all agree on what to do about the deer. The majority feel the deer are an addition to the community and that we can enjoy them while finding ways to mitigate the damage deer might to to our yards and gardens. Click here to see the result of the Alpine deer survey done in the fall of 2016. Mule deer are found throughout Utah in many types of habitats, including suburban neighborhoods and backyards. The mule deer gets its name from the size of its mule-like ears. It is the smallest member of the deer family in Utah. Mule deer migrate annually from high mountain habitats where they summer, to lower elevations in the winter, to avoid deep snow and to find food. They can be seen throughout the year and are mainly active at dusk and dawn. In winter, they may be active throughout the day. 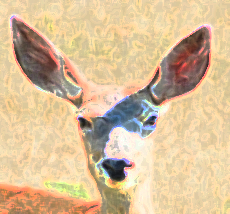 Mule deer are known as browsers. From late spring to early fall, mule deer gain weight and build up fat reserves by feeding heavily on broad-leafed plants and grasses. During the winter and early spring, when there is little forage available, their diet is mostly leaves, stems and buds. This type of vegetation is difficult to digest and lacks enough nutritional value to maintain top body condition. As such, mule deer must use stored body fat to survive. A deer’s winter survival depends on the weather, its stored fat reserves, and its ability to conserve energy. Deer need sufficient time to switch from a summer to winter diet. Offering the wrong foods, especially during the winter months, is harmful to deer and can kill them. Feeding deer not only makes them lose their natural wariness of humans, it can also contribute to the transmission of disease by unnaturally concentrating deer. Attracting deer to your property through feeding may attract predators, like cougars that follow deer herds. Feeding deer near neighborhoods and roadways increases the risk of deer-vehicle collisions. Annual migration patterns to wintering areas may be disrupted if the deer are enticed to remain at a feeding area. The most effective way to eliminate unwanted browsing by deer is to enclose the area with a fence that is at least 7-8 feet high. Entrances must be closed at all times, particularly at night. Lower fences, such as 4-foot chain-link, and decorative, wood or metal fences will reduce, but not eliminate deer use. Wrap highly susceptible landscaping plants with heavy burlap or plastic. Wrap trees with wire mesh or plastic cylinders. Avoid using ornamental plants in your landscaping. Instead, use native shrubs and plants that can withstand occasional browsing by deer. Plants that are preferred by deer and frequently suffer damage include: day lilies, firs, fruit trees, hostas, ivy, junipers, some pines, tulips and yews. For example instead of tulips, plant daisies; instead of crocus, plant tiger lilies; instead of hybrid roses, plant thorny roses; instead apple trees, plant narrowleaf cottonwood; instead of yew, plant yuccas; and instead of balsam fir; plant douglas fir. Click here for a complete list of plant recommendations. Additionally Alpine residents have found that motion/sound devices and sprays/deer scam can be effective. Around your house deer can become trapped and injured falling into window wells. Once in the well, deer may crash through the glass and do damage to the home in their efforts to escape. To prevent this cover window wells with commercially available grates, bubbles, fencing or build a cover using quarter-inch hardware cloth or wire. Always give deer plenty of space, especially while driving. SLOW DOWN while driving through deer habitats, especially at dawn and dusk, and during the spring and winter months when deer are migrating. 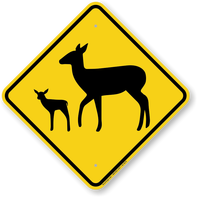 Watch for movement along the roadway if you see one deer there may be more. Although deer may be near a road at any time, be more alert during dusk and dawn. Males, or bucks, can be especially aggressive during the fall breeding season, which usually occurs in November. Also, if you see a deer fawn on its own, the best thing to do is to keep your distance and leave the animal right where you found it. Remember to always observe deer from a safe distance. Raccoons are found across the United States largely due to their excellent ability to adapt and take advantage of new habitats. Raccoons, although not native to Utah, are abundant throughout much of the state including the city of Alpine. Raccoons are most commonly found in wooded areas along rivers, marshes or lakes. Their scientific name means “washer” because they sometimes dunk their food in water before eating it. In suburban areas, raccoons will make dens in attics, chimneys, under houses, in abandoned buildings, and in woodpiles. Raccoons are active mainly at night and are solitary. Raccoons are a grizzled gray in color and are easily distinguished by their bushy tails with alternative black or gray rings, and black mask across their faces. The print of the hind foot faintly resembles that of a small child with tracks are about 4 ½ inches long. The hind print is longer than the front print and five toes can be clearly visible in the tracks of both feet. Raccoons are opportunistic omnivores. They will prey on poultry and small pets. They also eat plants, fish, insects, reptiles, birds and eggs. In suburban areas they will eat pet food, gardens and trash. Do not approach or try to feed raccoons. Keep bushes trimmed and woodpiles stacked neatly. Trim tree branches that extend over buildings to eliminate climbing structures. Trash should be kept indoors at night and put out the morning of pick-up. If this cannot be done, trash cans should be secured to avoid being overturned and the lids should be weighed or locked. Keep fallen fruit and vegetables picked up. Cover openings under porches and sheds. Cover window wells with a commercial grate. Install chimney caps and cover attic exhaust pipes with hardware cloth. Use woven wire fencing around poultry yards and gardens. Approximately 8 inches should be buried in the ground to prevent a raccoon from digging under. Keep poultry, rabbits and other hobby livestock secured in a building/barn at night. Install motion sensor lighting, and if possible use in conjunction with noise makers such as a radio. 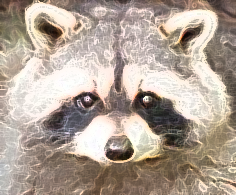 ​​A variety of materials, including dog or predator feces, blood meal, dirty laundry (human scent), and mothballs have been tested to repel raccoons; however, none have been proven to be totally effective. If you have a problem with raccoons that cannot be resolved by following these tips consult a professional, licensed animal control company. Click here for more information. Always observe raccoons at a distance. Raccoons may carry fleas, ticks, lice, distemper, mange, rabies, and canine and feline parovirus. Raccoon feces may also contain the roundworm egg. Cougars live all across Utah, from the High Uintas wilderness to the dry southern deserts. The cougar has been a protected wildlife species in Utah since 1967. Cougars are solitary animals. They usually hunt alone at dawn and dusk. The main prey of cougars is deer so they will be found wherever deer are. They will also eat elk, antelope, small mammals and birds. After making a kill, a cougar will often take the carcass to the base of a tree and cover it with soil, leaves or snow, saving it to feed on later. Do not feed wild cougars. Do not feed deer or other wildlife. Remove vegetation on your property that encourages deer to feed. Remember, predators follow prey. Keep pets indoors or in a secure shelter at night. Do not let your pets run free. Accompany them outside. Do not leave pet food outside. Keep farm animals/poultry in sheds or barns at night, especially during calving or lambing season. Store garbage in cans with tight lids to discourage small mammals that may attract cougars. Light up walkways and remove vegetation that may be hiding places for cougars. Keep garage, barn or shed doors shut. Always observe cougars at a distance! As with any wild animal, do not approach a wild cougar. Use binoculars to get a closer view. Cougar attacks on humans are extremely rare. In North America, only 20 fatal attacks have been reported in the last 100 years. However, today, sightings and reports of cougars are on the rise. As human development continues to expand and wild habitat dwindles, the more likely people are to encounter a cougar. Do not hike or jog alone. Go out in small groups and stay together. Make noise to avoid surprising a cougar. Keep small children close to the group. Do not let them go too far ahead or lag behind. Do not stay near a dead animal, particularly one that appears to have been cached (partially covered with dirt or leaves). Keep a clean camp area. Do not leave pets at the campsite alone. Stop, stand up tall and DO NOT RUN. Pick up small children, control pets. Face the cougar and talk to it firmly, while backing away. Give the cat an escape route away from you too. DO NOT TURN YOUR BACK. Make yourself look bigger. Example: wave backpack, open up your jacket, stand on a stump. If the cat does not leave, yell and scream and wave arms. Be assertive. Convince the cat that you are not prey. DO NOT BEND OVER TO PICK UP OBJECTS TO THROW. Doing so will make you appear small and weak. If the cougar attacks, fight back! Generally, if you are aggressive enough the cat will realize it has made a mistake and flee. If you have an encounter with a cougar, please alert the Utah Division of Wildlife Resources (UDWR). If the encounter or sighting occurs after hours or on the weekend, please call your local police department or county sheriff’s office, who can contact a conservation officer to handle the situation. The coyote is a member of the dog family Canidae. They can be found throughout the United States and are quite common in Utah. They are adapted to a wide range of habitats, including urban areas such as inner cities and suburban neighborhoods. Adult coyotes typically weigh 25-45 pounds. Coyotes are brownish-gray or light gray to reddish in color with a cream-colored belly. They have a long, slender muzzle, bushy tail and triangular ears. Their main vocalizations are loud yipping or short bark howls. Adult coyote tracks are typically 2 ½ - 3 inches long with claws present in the track. Coyotes are mainly active at night, but will hunt during the day. Coyotes are opportunistic predators. They eat small mammals, insects, reptiles, birds, carrion, grasses and fruit. Near human habitation, coyotes may seek trash and pet chow as food. Remove attractants from your property, including pet food, water sources, bird feeders and fallen fruit. Secure trash in a locked receptacle. Keep it inside or put it out only on the morning of pick up. Trim vegetation around your yard to reduce hiding places. As a deterrent, install outdoor and motionsensitive lighting around your property. Lights also make approaching coyotes visible. If a coyote is on your property make it feel unwelcome: yell, throw rocks, bang pots and pans, spray it with a hose or turn on sprinklers. Supervise pets when they are outside, especially at dawn and dusk. Never leave pets alone outside after dark. Keep dogs leashed, especially when on trails and in open areas. Never let your dog chase or “play” with coyotes. Make noise while hiking to alert wildlife of your presence. Do not approach a coyote. Pick up small pets, make loud noises, stomp your feet, or throw rocks or sticks if necessary to frighten the coyote away. Do not run or turn your back on a coyote that has approached you. Face the coyote, shout at it, be as big and loud as possible, wave your arms and back away slowly. If you have an encounter with a coyote, please alert the Utah Division of Wildlife Resources (UDWR). If the encounter or sighting occurs after hours or on the weekend, please call your local police department or county sheriff’s office, who can contact a conservation officer to handle the situation. There are two general types of snakes: non-venomous and venomous. Some venomous snakes in the U.S. are called pit vipers. Pit vipers, such as the rattlesnakes, inject venom into their prey’s body through two hollow, front fangs in their upper jaw. When not in use, the fangs fold back along the inside of the mouth. The snakes’ venom disables their prey. Of more than 200 different species of snakes found in the U.S., 19 species are venomous. Rattlesnakes, water moccasins (cotton mouths), copperheads and coral snakes are some of the venomous snakes one may encounter in North America. Depending on the species, rattlesnakes can be found in all types of habitats, from grasslands, lakes and rivers, to deserts or forests. Snakes are cold-blooded and are very sensitive to external temperatures. During cold weather they hibernate in rock crevices or burrows underground. During warm weather most rattlesnakes become active at dawn and dusk. They can be seen during the daytime, basking in the sunlight to help regulate their body temperature. Like most snakes, rattlesnakes shed their skin as they grow, about three to five times a year. After each shed a new segment is added to their rattle. Rattlesnakes prefer to prey on warm-blooded animals, mainly rodents like rats and mice. They will also eat birds, insects, eggs, amphibians and other reptiles. Adult snakes usually only need to feed once a week or less. Snakes eat their prey whole. Their skin is very stretchable and they have jaws that are loosely connected, allowing them to open wide to eat animals larger than their head. Snakes are very important in controlling the population of rodents and insects. Trim vegetation and remove wood and rock piles to reduce hiding places. Control rodents on your property; remove bird feeders, an attractant to rodents. Seal any cracks in building foundations, porches, pipes and windows. Observing rattlesnakes at a safe distance is the best way to avoid being bitten. Never try to poke or handle a venomous snake. Teach children to leave snakes alone. Stay on paths and cleared areas. If you must travel in brush or tall grass, use a stick to sweep the area as you walk. Do not gather firewood at night when snakes are more active. Be careful reaching into woodpiles, stacked building materials or brush piles. When camping, use a floored tent with a zipper door. Don’t walk around the campsite in the dark without a flashlight. Keep shoes and clothing inside the tent. Look carefully before sitting down on the ground or on rocks and logs. Wear boots or other closed-toe shoes while hiking. If you encounter a rattlesnake away from human developments, leave it alone. It is in its natural environment. If you hear a rattle, don’t move away until you know where the sound is coming from. Back away slowly and make sure you have a clear space to exit and not trip or fall.